Relatives and friends of Faoa Aitofele Sunia and Rep. Larry Sanitoa packed the Tradewinds Hotel poolside and pavilion Saturday to officially launch their campaign to become the next governor and lt governor of American Samoa. The invitees included traditional leaders, clergy, business associates and friends of Faoa and Sanitoa. This was a first public gathering for the families of the two candidates which also served as a beginning fundraiser for the team’s campaign chest. Over $50,000 was counted Saturday and a committee member said donations were still flowing in. The traditional leaders who were present, some there as family and some as supporters included Mauga Tasi Asuega, Secretary for Samoan Affairs , representing one of the clans of Mrs. Elisapeta Sunia, District Governor Lualemaga Faoa, Lefiti Pese, Faiivae Iuli, Fagaima Solaita, Pulu Ae Ae Jr, Ufuti Faafetai Ieremia and Savea Tavita. Former Governor Togiola Tulafono was also there with former First Lady Maryann. Religious leaders included Rev. Tusi Seanoa of the Congregational Christian Church of American Samoa Petesa-uta, where Faoa and Mrs Sunia worship, who gave the invocation, Bishop Peter Brown, leader of the local Catholic Church to which Sanitoa belongs, Fr. Vaiula Iulio who gave the closing prayer, Rev. 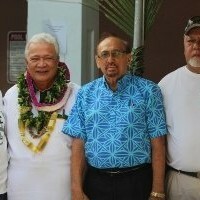 Elder Elia Taase of the CCCAS Nu’uuli, and Rev. Tafao of the Baptist Church, brothers-in-law of Faoa. A few business owners were also in the crowd. After the opening prayer, Sanitoa was the first to take the podium, and was emotional when he thanked his District of Tuala-uta for giving him four terms as their representative in the House. He said without the hardworking families of his “beloved Tuala-uta” he would not be where he is today. Reading from a prepared speech, he touched on several challenges facing the government, including ASG’s fiscal health, the poor state of the hospital, the sagging economy, the poor grades of students and the Economic Development Authority bonds. Sanitoa said his selection as Faoa’s running mate was recognition of the voice of the younger generation. The lt. governor candidate also spoke about his health. He gave special thanks to American Samoa Government employees who were present and added that there were many other employees who wanted to be there but couldn’t. But he stressed there are laws to protect a person’s right to vote freely for who they choose. Faoa’s comments in English were mainly for the benefit of business associate of Sanitoa and a few voters who were not Samoan. Faoa spoke at length about Sanitoa’s experience as a lawmaker, in his private sector jobs, his membership in community organizations, and involvement in sports and the church. Faoa said he will look to his running mate for shared decision making if elected.